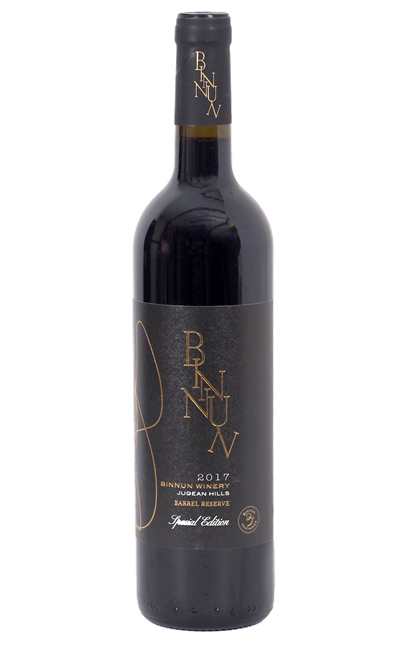 A delightful wine by Ben-Nun winery, Special Edition Barrel Reserve is a tart dry red made of Cabernet Sauvignon, Merlot, Cabernet Franc and a little Petit Verdot grapes from the Judean hills. Ben-Nun Special Edition Barrel Reserve is part of a special series. A limited edition Israeli wine, it is a great blend of Cabernet Sauvignon, Merlot, Cabernet Franc and a little Petit Verdot, all from one vineyard from the Judean Hills area. A kosher dry red wine, the grapes we're fermented in containers at a controlled temperature, after which the wine was seasoned for a period of 10 months in new French oak barrels. Purplish red in color, its aroma is of black plum, cranberries, and other berries, along with a hint of spice, and the taste is full-bodied, sharp tannins, balanced acidity and a long and fruity finish.